This is another great wall poster available from the Cartridge Comparison Guide website. This one is specific to handgun caliber cartridges. It is extremely detailed and complete. 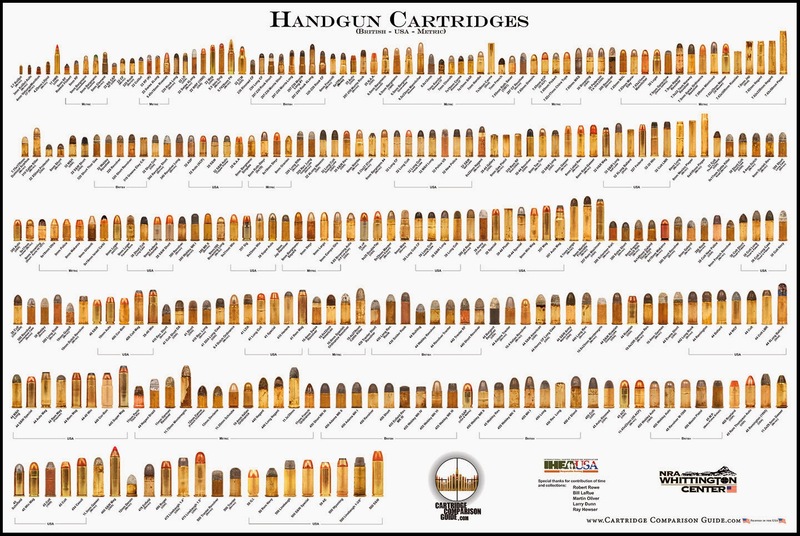 The Handgun Cartridges poster contains Metric, USA, and British cartridges. Includes a full range of cartridges from the 2.7mm and 3mm Kolibris up to 50 Cal cartridges such as the 500 Tranter, 50 G.I., 50 A&E (Desert Eagle), and the 500 S&W. The poster features the first revolver and automatic cartridges from the 1800s into the early 1900s from all over the world. From the American Wild West the first Colt, Remington, Ballard, M&H, Henry, Herters, and Army revolver cartridges. From England & Europe - Rook, Morris, Francotte, Canne, Roth, Cattle Killer, Rast-Gassers, Ordinance (French, Dutch, German, Italian, Swiss), Russian, Montenegrin, Nagant Brazil, and Genschow. The poster also includes modern cartridges such as the 5.7x28 FN, 22 TCM, 25 & 32 N.A.A., 9x18mm Ultra, 357 Sig, 9x25 DoubleTap, 357 Rem. Max, 400 Cor-Bon, 445 Super Mag, 460 Roland, and more.